What Commands Can I Send? Below we present a tiny Python server script which connects to an AxiDraw plotter plugged into your local computer, listens for connections on the internet, and allows remote clients to send commands to your plotter. you and your friends all like to program AxiDraw and are tired of moving the cable around. you wish to plot on AxiDraw from an Android, iOS, or other device with no USB port. you wish to plot on AxiDraw from the other side of the planet. 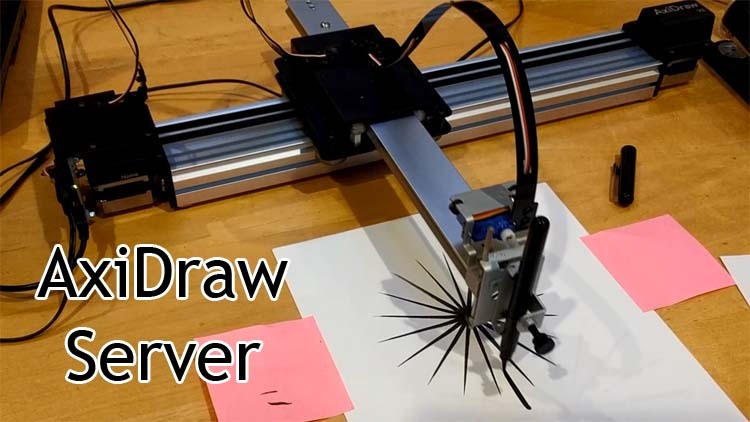 you want to share an AxiDraw for use with high-level applications like Inkscape. you don't want to write code. You will need Python3 installed. Our Python server uses the super-cool "Unofficial Python library" called axi from fogleman at https://github.com/fogleman/axi. Fogleman's axi library handles the low-level USB location of and communication with the AxiDraw plotter. We use this support to establish a pipe of communication with the plotter. Fogleman's axi library also has a collection of handy high-level utilities to do path planning and other tasks which you can access as an option (more below). So, first follow the installation instructions on Fogleman's github page to install the axi package in your copy of Python. Python axi module Installation tip: the particular MacBook on which I was installing Fogleman's axi package happened to have both python and python3 installed, and this caused huge problems for me because various parts of the installation kept trying to use python instead of python3. While Fogleman's module is downloadable from his github page, his module depends on 4-5 other modules that the installer must download from a central repository, and this failed for me repeatedly. You can tell that some part of the installer is using python (not 3) because you will get inscrutable TLS/SSL errors that make no sense. I had to change various parts of the instuctions by adding 3's everywhere, including using pip3 and I think even modifying one script involved in the installation, and also I had to manually install each of the 4-5 modules you will see mentioned when you try to install, before axi would finally install successfully. It's better if you just don't have pre-3 python at all and if your python3 is called just "python." You will not need Fogleman's axi command-line program to use our server, but it's a good test to make sure this layer is working ok. If you connect to the server and simply start typing stuff, you will be sending raw commands using the surprisingly well-documented EBB command set. This lets you control the plotter X, Y, and Z position at the most basic level. Advantage: You have full control of the plotter. Disadvantage: You have to do all your own path planning for efficient drawing of complex scenes (e.g. slow down around curves, draw lines close together, etc.). Possible Dangers: You can easily permanently damage your plotter if you tell it to go past its XY or Z (pen height) range, and probably in other ways too. Use at your own risk! Our server has a simple high-level interface that lets you securely send a "drawing" consisting of any number of 2-D strokes of any complexity. Once you finish sending your whole "drawing," our server uses the path planning facilities of Fogleman's axi library to plot your points efficiently and with high quality. Each stroke sub-command describes the path of one pen-down-move-move-move-pen-up sequence, with an unlimited number of moves per stroke and an unlimited number of strokes. The x and y coordinates are scaled so that 0.0 maps to coordinate 0 on the printer (closest to the USB connector in both axes) and 1.0 maps to the V3_SIZEX/V3_SIZEY scaling value (in inches) from axiserver.py. You can use coordinates greater than 1.0 and they will simply extrapolate beyond V3_SIZEX/V3_SIZEY. So for example if you have an 8.5 x 11 inch piece of paper and you set V3_SIZEX == V3_SIZEY == 8.5 then you can access the extra 2.5 inches in one dimension by using x values greater than 1.0. You will generally want to set V3_SIZEX == V3_SIZEY unless you use the special NX/NY feature described below. Advantage: You get the high drawing speed and accuracy benefits of path planning. Advantage 2: If you issue several drawing_start/drawing_end commands in a row, and you have set the NX and NY parameters in axiserver.py to something other than 1, then axiserver.py will subdivide your paper into sub-rectangles and send each plot to a new sub-rectangle. The 0.0-1.0 values described above get further scaled down to fit the sub-rectangle. This is great when you are debugging some plotting code and you don't want to keep replacing the paper or moving the plotter head. If NX != NY then you will want to set V3_SIZEX/V3_SIZEY accordingly to prevent your drawing from being stretched or squished in one axis. For example, if NX==3 and NY==2 then a reasonable scaling value to keep things in proportion is V3_SIZEX==12 and V3_SIZEY==8.5. Disadvantage: You don't have as much control as the low-level API (which is useful for things like our 3-D AxiDraw Plotting Hack). You only have access to one small part of what Fogleman's library offers. Possible Dangers: You can still easily permanently damage your plotter if you tell it to go past its XY or Z (pen height) range, and probably in other ways too. Use at your own risk! and the server will happily "exec" your code, no matter what it is. Advantage: You have access to the Fogleman axi object and so you can use any feature of his axi Python library, or for that matter any other library or any facility available to Python! Disadvantage: You have to figure out the axi library, which is a bit more complex than PATHCMD. Definite Danger: SUPER SUPER SECURITY HOLE! This feature can only be used on a secure local network where you trust every device on the network. It essentially gives the whole world complete access to your computer without a password! They can do anything a Python script can do, including delete all your files and run programs. For that reason, Method 3 is disabled by default. You can enable the feature by uncommenting the "exec" line in the server. Use at your own risk! By default, the server listens on the highly creative port 12345, but you can change this in the code where it says CHANGE PORT NUMBER HERE. You can type commands and see responses immediately. sock.bind(('', 12345))  # CHANGE PORT NUMBER HERE! # DANGEROUS on public networks!!!! source += buf + "\n"
If your client is in C you can use this code to connect to the server, send commands, and receive responses. //      Demo C code to send path to axidraw plotter over the net. // here we send commands in python to the server. // WARNING: this may make your host vulnerable! If your client is in Perl, you can find client code to connect to our server on the page with our 3-D AxiDraw Plotting Hack. Simply Google the name of your programming language and "simple TCP client" or "simple socket open code." You want to open the host running the server on port 12345 (or whatever number you provided in axiserver.py) and then send commands as seen in the other sample code above. You can also share an AxiDraw device by opening up ssh (secure remote shell) on the computer physically connected to the device and allowing people to log into your computer and run whatever script. ssh Advantages: Secure connection method that works over the general internet and on untrusted networks. Lets client do pretty much anything on the server, but only if they have proper credentials. No need for a custom server program. ssh Disadvantages: Making an ssh connection from client C/Python/Perl/... code is much much more code (not just the 30-line samples you see above), unless the client uses their programming language's "system()/popen()" call to run a command-line ssh client, which may be inefficient depending on the application. The client gets complete access to the server (can run any program, delete files accessible by the ssh user), so the owner of the server needs to trust the client user more than with Method 1 and Method 2 above (but less than with Method 3!). It is possible to limit impact somewhat by creating a separate user just for this purpose. The client cannot use the high-level functionality of PATHCMD (including its ability to put multiple drawings on one page in sub-rectangles) but on the other hand it has access to a world of ready-made scripts to do things with AxiDraw. If you found this interesting, you might like to check out our 3-D AxiDraw Plotting Hack, which lets you continuously move your plotter pen in X, Y, and Z (pen height) simultaneously to create interesting artistic effects with a brush pen.